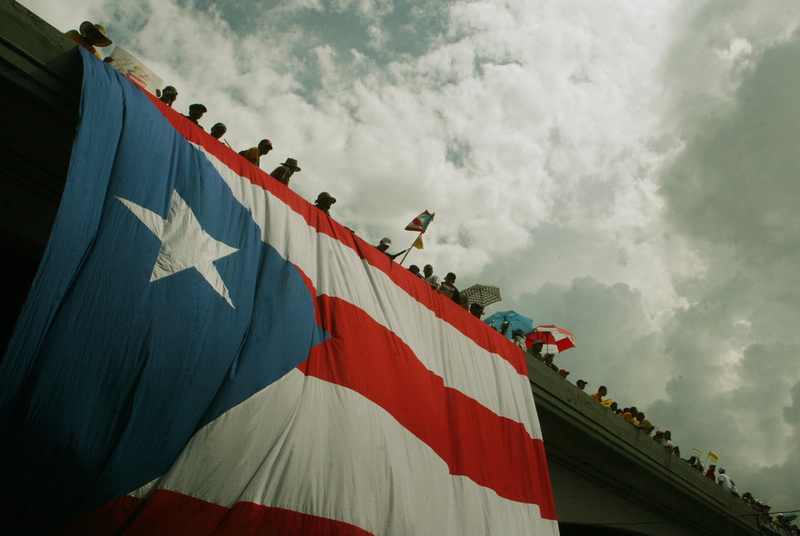 Will the evisceration of democracy in Puerto Rico be allowed to proceed unnoticed? The dominant narrative about Latinos in US presidential politics goes something like this: a rapidly growing segment of the population, Latinos are a force to be reckoned with, and now that Donald Trump has shown himself to be an unrestrained bigot preparing to unleash a deportation brigade — a posture that has lost him the support of even the most conservative Hispanic political leaders — he’s pretty much assured himself of defeat. In key swing state like Florida, Latinos will help deliver Hillary Clinton to victory. Yet in recent weeks, as the center-left media relentlessly played clips of Trump snarling, Trump and Mexican President Enrique Peña Nieto looking like fools at the podium, and #TacoTrucksOnEveryCorner guy Marco Gutiérrez holding forth on “dominant” cultures, it became increasingly clear that we are being distracted from the serious issues that face Latinos and Latin Americans alike. Some more salient questions that should be posed: what role has neoliberalism played in the deterioration of conditions for Mexicans north and south of the border? To what extent have US military strategies to control the border and fight the “war on drugs” created extreme violence in northern Mexico? Will justice finally come to the families of the forty-three students murdered in the small Mexican town of Ayotzinapa? Will police violence continue to be meted out against striking teachers in places like Oaxaca? Why do both US and Mexican elites ignore the staggering increase in wealth inequality in Mexico, where almost half the country’s wealth is held by the richest 1 percent? The outsized focus on Trump’s bigoted antics diverts attention from another major issue that should concern Latinos in the US: the evisceration of democracy in the unincorporated territory of Puerto Rico, set in motion by an odious piece of legislation known as PROMESA. The law, signed this summer by President Obama, established a fiscal oversight board composed of four Republicans and three Democrats with virtually complete control over the island’s economic (and, by extension, political) affairs. Three of the Republican appointees are particularly egregious: Carlos M. García, previously a Government Development Bank head under former Puerto Rico governor Luis Fortuño (who not only built up the public debt by accelerating the government’s reckless bond sales, but helped weaken the economy by laying off twenty thousand government workers); José Carrión, who is resident commissioner Pedro Pierluisi’s brother-in-law and whose sister (Pierluisi’s wife) runs a consulting firm involved with Puerto Rico bondholders; and Andrew Biggs, an American Enterprise Institute scholar whose main claim to fame is his role helping devise ways to privatize Social Security during George W. Bush’s administration. The three Democratic appointees — Arthur González, a senior fellow at New York University’s School of Law and a former federal bankruptcy judge; Jose Ramón González, president and chief executive officer of the Federal Home Loan Bank of New York; and Ana Matosantos, former California budget director — have received less scrutiny, but their strong ties to the financial sector and tenuous political and economic connections to Puerto Rico are also cause for concern. This could be because the average Puerto Rican already knew, at least subliminally, that she had limited control over the island’s political affairs to begin with; the PROMESA era is just the latest twist in five hundred years of colonial rule. Indeed, the naming of several PROMESA board members of Puerto Rican or Latino ancestry wasn’t a repudiation of the colonial model. Colonialism today operates through the selection of Puerto Rican elites who are friendly to the financial sector and therefore hostile to the interests of the Puerto Rican people. A recent broadcast of “Puerto Crítico” on Bonita Radio — featuring scholars Carlos Pabón and Argeo Quiñones and hosted by Juan Carlos Rivera Ramos and Miguel Rodríguez Casellas — helped tease out some of these issues. As Pabón notes, after decades of minimal criticism (outside of a dedicated core of leftists), neoliberalism is beginning to show significant cracks. Yet at the same moment neoliberalism is reeling from a crisis in confidence — as well as an inability to stem the growing problem of wealth inequality — the US has chosen to impose one of the most blatantly undemocratic, neoliberal projects on Puerto Rico. I’m reminded of my summers as a kid in Puerto Rico, when I’d go to the store to buy soda and find discontinued brands, dumped on the island for second-rate consumer-citizens. The island has always been a laboratory for biological, social, and economic experimentation, and a repository for failed commodity and ideological production: Social Security privatization defeated during the Bush administration? Let’s bring it to Puerto Rico. What is the motivation for this? To make sure that the municipal bond market isn’t disrupted and the states or non-bankruptcy-protected entities that run up massive unplayable debts realize what their fate will soon be. And, of course, so that all those vulture fund guys can own half of El Condado and have new branded cocktails named after them. While purporting to restore Puerto Rico’s economic viability, in effect the PROMESA board (or La Junta, as isleños call it) is a takeover of elected government by finance-sector technocrats. It is, as Pabón points out, about normalizing the removal of political power from the people and obliterating democratic spaces. So where do we go from here? Pabón insists that there is a positive aspect in all of this: a growing number of Puerto Ricans see both of the colonial political parties (one of whom favors the current status, the other, statehood) as corrupt and ineffectual. That disgust at the status quo can be used to drive a movement for change — one animated by the idea of a true island democracy rather than the colonial mentality that Puerto Ricans are incapable of running their own affairs and need a panel of finance-sector people to decide everything. Comments by Puerto Rican economist Antonio Fernós Sagebién at the recent PROMESA conference, though disguised as an argument for the superiority of financial thinking over political thinking, aptly demonstrate this colonial mentality. But again, there is some reason for optimism. The actions of demonstrators — who predicted the current state of affairs five years ago — seem more in tune with the broader public than ever. And watching the island’s recent gubernatorial debate, you could even see how the rhetoric of left candidates — Rafael Bernabe of the emerging Working Peoples Party and María de Lourdes Santiago of the ripe-for-change Independence Party — could become the mainstream narrative in Puerto Rico. Things often come late to Puerto Rico. But in an important way, Puerto Rico is ahead of the curve here — its citizens are recognizing that the two-party system in the US is a charade and does not represent their interests. Rather than being swayed by American exceptionalism, it’s increasingly seeing the blatant hypocrisy in the US’s posture as an exporter of democracy. As for those in the US, it’s easy to fixate on the repulsiveness of Trump, to claim the moral high ground over a candidate who lacks even a rudimentary grasp of what it means to have humanity. But this risks overlooking two of the most consequential developments south of the US border: Mexico is convulsing in a NAFTA-made, life-threatening paroxysm that has exacerbated previously existing flaws in its politics. And there is a growing mass of Puerto Rico’s 3.5 million second-class American citizens who are increasingly aware that the emperor, no matter which one is elected, has no clothes.